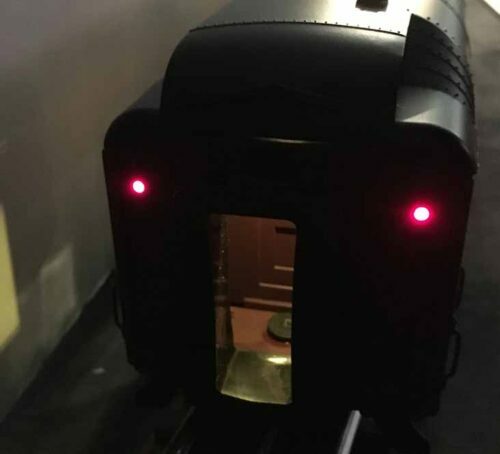 Most baggage cars had some form of lighting so the workers could find things. This kit uses track power and reaches full brightness around 8.5 volts track voltage. Baggage compartment door areas (two) each have a set of LED lights. Brightness is user defined and flicker free. MTH Premier version has plug. Please indicate if Lionel scale version in the notes with your order as the distance between the doors is greater. There are three basic options. 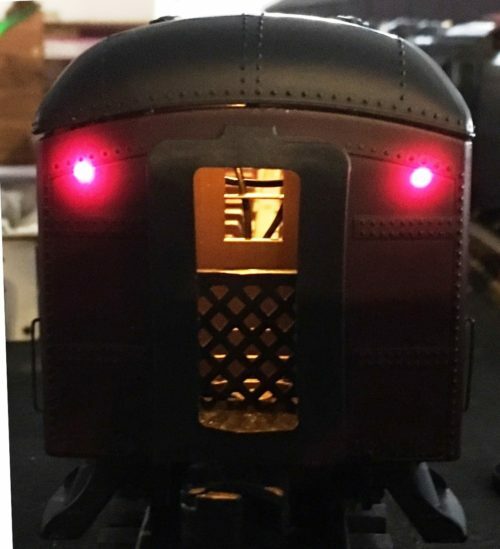 The first two use the standard passenger LED lighting kit and may be ordered here or as a coach car. These are further defined as with MTH Premier Plug or with 6″ tails. This kit is 15 5/8″ long. If you have a shorter baggage car, then you want the third option which comes with a supply, two 2″ segments and 6″ power tails. This later version is cheaper, fully lights the two baggage areas, and requires more work to assemble. Kit includes the LED lights, power supply, and feed wires/connector the track connections. This kit is connected to the existing plug or wires from the car trucks.